JPCass wrote: Interesting, the same seller who has that Extraordinary plaque, is the one who I bought the case and mech from last week - assuming they went together, though they were auctioned separately (the machine, which doesn't have a handle, appeared to have come out of an original wood stand, which they also listed showing the machine in it but specified as not included - contributing to my impression that they were piecing it out - but then ended that listing). First off the stand that he had for sale was not an original wood stand. The machine that you bought was a stand alone table top machine. It was not originally in a stand up console. If it was it would have had a larger wood base on it. I have a stand just like the one he had for sale and I know hat it is not original mills but close to it. If you look at the sides of the console you will see that the grain pattern in the wood goes sideways instead of up and down. Also the wood cabinet on the slot machine would have had 4 grooves cut in it to allow you to get to the screws that held the two small back panels in place on the console. oldslotman wrote: First off the stand that he had for sale was not an original wood stand. The machine that you bought was a stand alone table top machine. It was not originally in a stand up console. If it was it would have had a larger wood base on it. I have a stand just like the one he had for sale and I know hat it is not original mills but close to it. If you look at the sides of the console you will see that the grain pattern in the wood goes sideways instead of up and down. Also the wood cabinet on the slot machine would have had 4 grooves cut in it to allow you to get to the screws that held the two small back panels in place on the console. Thanks for the education on those points, I hadn't realized that machines had specific cabinets for console use. Though I was a bit tempted by the console look, I hadn't had a good chance to check it out before the listing was taken down, and I was really looking for a table top machine anyway, so that's fine. Hopefully it will turn out to be more or less what I was looking for in other respects, as well - I know I may have missed a thing or two, but that's OK with me. The old Extraordinary that I restored years ago, and then had get away from me, was a real "barn find" with no escalator, plus stripped of some mech parts like the coin tube and the tops of the pillow blocks for the reel shaft (those were hard to find, at least back then), and some of the old time part dealers told me it was probably hopeless, so this looks pretty good in comparison, and is the exact early version that I wanted, even if I may have paid a bit of a premium and am in for a few surprises. The machine that you have should be OK and even better if it has the gold award feature. oldslotman wrote: The machine that you have should be OK and even better if it has the gold award feature. Thanks for the reassurance from a seasoned eye. It occurs to me now, that maybe one of the reasons that it got bid up was the apparent presence of the gold award feature. I'm not that interested in it and might even leave it (re-)painted over if it's there (and with new non-award reel strips, of course saving the old ones) but it will be fun to check out, and good to know that the machine would have extra appeal and value to whoever gets it next, whenever that may be - I don't intend to let this one get away from me until they pry it from my cold, dead hands! The machine came in, and I'm going to post a bunch of pics and info to the Finds thread as promised - but I just had a quick look and it will be a week or more before I can get back to it, so let me post a few preliminaries here. By way of explanation, I bought my original slot, a Word's Fair / Extraordinary, because I had enjoyed playing the old slot in a friend's basement, and came across this "barn find" that I really liked the looks of being a fan of art deco. 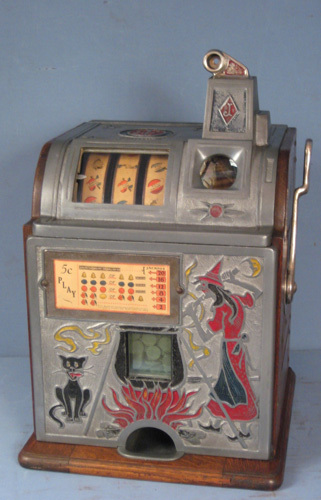 My first machine was an early version with the double visible jackpot and two-part front, which I like better, from the mid-30s if not actually 1933/34. My mother even picked up Chicago World's Fair memorabilia for me at flea markets, to go with the machine. And so I just have to shout - THE MECH HAS ITS ORIGINAL 1934 WORLD'S FAIR SPECIAL REEL STRIPS! They reference the World Fair (see photo), and interestingly all three reels have strips put together with several splices - I can see a date of 8-34 under one - so it must have been a special configuration, perhaps higher payout? The mech number is about 2,500 lower than the case number (341895), so I presume they're not an original pairing. And, yes, the mech and the case are Gold Award - all the actuator parts are there on the Gold Award dispenser, it has just apparently had its glass window painted over. The award card, which looks to be original, lists varying payouts - a feature I haven't encountered before. I don't really have very broad experience, just a fair bit of depth on the Silents from rebuilding my first one completely and then working on a couple of others for dealers and owners. Its eagle plate is etched stainless one (compared to the other one noted in a post above that was recently on eBay, which looks to be just paint applied on flat metal) of some age, with about 75% of the paint remaining, and no frame - but that's not original, is it, weren't they all paper with frames to begin with? Below it, it appears that there was some sort of label attached which was painted over later. The mech has a bunch of old nickels in it, the newest being still-shiny ones from the late 1970s and then the early 1980s up through 1983, so I assume this has been mothballed for about 30 years. Needless to say, I'm pleased as punch to have found just what I've been looking for - and have a good bit of work ahead of me, particularly on the case. I plan to restore it to the blue and silver scheme shown in the earliest Mills advertising for the machine, like I posted initially. - Reel bundle for a standard silent without gold award (SP? ), reel tins could be in need of replacement (including missing); I may want to run the machine for guests to play with traditional bell-fruit reel strips and no gold award, and put the original reels away. Reel strips - note Gold Award symbol on the left, reference to World's Fair on the bar symbol on the right. More of reel strips - note how one on right has two symbols spliced in; all the reels seem to be customized like that, not just the single extra lemon or something I have seen before. I had another chance to spend a bit more time examining the machine, so I thought I'd add a bit more about it here, particularly regarding the mystery of the altered reel strips if anyone is curious about that. First, I wanted to note that the mechanism is numbered 339398, as best I can tell from trying to read the old label. With the mechanism out, I had a chance to load a Gold Award token that I happened to have around, and manually cycle it through a dispensing cycle - it works just fine, though probably too stiffly due to lack of lubrication. I realized, that I forgot to pull out the award card from its frame and see if there were numberings I could pick up. Anyway, it looks like a Special Gold Award card with the Gold Award simply left off the top - there is a space at the top, and no sign of alteration like erasure or overlay. That at least must have been changed out, when the Gold Award was disabled. The Gold Award symbols are not particularly obvious, especially with the "fortunes" jokes printed through them, and so I am guessing that the operator assumed that when the Gold Award was disabled, users would just take them for something like a lemon, another yellow non-payout symbol. The disc set is stamped SG-1, but has some holes very neatly filled with flush blanks as if done at the factory - corresponding to the alterations to the reel strips. Then, the Gold Award notches have been disabled by brazing washers on to one side of the discs - I don't know why they didn't just disable or remove the Gold Award trip lever. Reel strip 3 has a three symbol overlay starting at position 16, of Orange (over Orange), Plum (over Plum), and Lemon (over Bell). Thus, odds have been reduced by placing lemons over a Bell, an Orange, and a second Bell. If I were going to run the machine with those reels, I'd put bugs on those extra lemons to bring the odds back down to normal to make play for amusement a bit more fun; instead, I think I am going to find a regular SP reel bundle to run with more familiar Bell-Fruit-Bar strips, put the original away and mothball the Gold Award features for the eventual next owner. they always use a three symbol over lay so you only see one splice at a time on any one reel in the reel windows. rtmccurdy wrote: I have two Mills Extraordinary slots that have a gold award. #885517 on the left is original (untouched) 5-cent 2-part with gold award, 2-view jackpot, orig. chrome, and star side vendor (have the vendor---need the inner linkage!). The other I restored (#438034 10-cent, originally untouched) ............. ? by the time Mills got that high, they were making M Model machines.